JUF's Create a Jewish Legacy is a hands-on endowment fundraising program that strengthens the Jewish community by training and supporting Chicago Jewish agencies, day schools and synagogues in the area of legacy giving and endowments. The program teaches professional staff and volunteers how to secure legacy gifts for endowments, which will provide a steady and potentially growing stream of dollars to sustain them for generations to come. Create a Jewish Legacy is a program designed to train and support Chicago's Jewish day schools, agencies, and synagogues in the area of legacy giving. 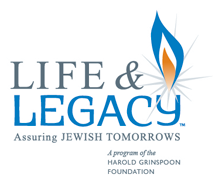 Supported by the Harold Grinspoon Foundation and the Crown Family, Create a Jewish Legacy helps ensure the sustainability of the Jewish community for years to come. In one way or another, your life is rooted in Jewish experiences connecting you to the Jewish community. Chances are you already support Jewish charitable organizations in Chicago, but have you included these organizations in your will or estate plan? By leaving a legacy, you can assure that the traditions and institutions that mean so much to you today will be there for future generations. See a list of participating organizations. Preserve the programs and organizations that support Jewish life in Chicago. Make a gift through a bequest in a will, trust or estate plan. Add (or change) a beneficiary designation on an IRA, pension fund, or life insurance policy. Your legacy commitment can be expressed as a specific dollar amount or as a percentage. Give an outright cash gift to the endowment. Increase your current income while making a gift through a Charitable Gift Annuity or Charitable Remainder Trust. Reflect on your Jewish passions and discuss them with your loved ones. Contact the participating organization(s) closest to your heart. If you make your legacy commitment now, or share with the organization(s) that you have already made a legacy commitment, the organization(s) can secure a $5,000 or $10,000 incentive grant! Contact JUF with any questions or simply fill out a Declaration of Intent Form. Formalize your commitment by having a conversation with your personal financial advisor or attorney or contact cjlchicago@juf.org for more information.